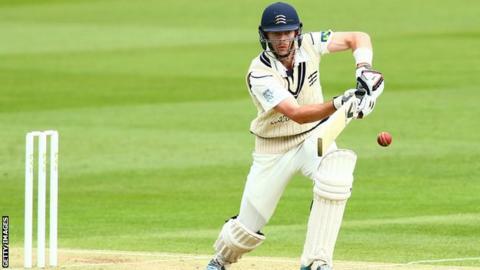 James Harris and Tim Murtagh survived a tense final hour to earn Middlesex a draw against Nottinghamshire. The pair came together at 264-7 with their side seemingly heading for defeat in their opening Championship match. But they led their side to 300-7, with Harris 32 not out and Murtagh on 18. Earlier, Nick Compton (85) and Adam Voges (72) each played solidly, but with David Malan injured, Voges' exit appeared to have given Notts the chance to force a victory. Thomas Helm quickly followed Voges back into the pavilion, but Harris and Murtagh came safely through the final 19 overs. Middlesex had started the day on 57-1 - 462 runs behind the visitors - with Compton unbeaten on 37. The former England opener shared a second wicket stand of 132 with Nick Gubbins (37), who was the only man to fall before lunch, and gave the hosts hope of survival. Compton and Voges both fell victim to left-arm pace bowler Harry Gurney (3-69) - the former gloving a catch to first slip and Voges bowled off the inside edge - as the momentum swung the way of Notts in the afternoon session. "It felt a little like the one that got away but we didn't ever get that close. Nine down is the one that gets away; seven down we could have been there for another hour and a half and not got them. "But because we played good cricket for four days we do feel a bit deflated about it. "We bowled with good control, good skills. Jake Ball and Harry Gurney were outstanding at times, Samit Patel bowled nicely so over the course of the four days I've got no complaints about the performance. "Wins are hard to come by so when you just miss out on one it's frustrating." "The great escape. It was a hell of an effort from the guys. "I don't think many would have given us a chance when we went in yesterday but the way Gubbo (Nick Gubbins) batted was phenomenal. For a young guy who has just come into the team he looked very organised and his guts and determination bode well for everyone. "Mine wasn't a good-looking knock by any stretch of the imagination. It felt horrible at times but that's the beginning of the season and it is difficult. "It's about finding your feet, finding your confidence and that took a while but in the end I was glad to do a good job for the side and disappointed not to get a hundred on my return to Lord's."